Biomaterials serve as synthetic or natural materials used to replace parts of living systems or to function contact with living tissue. Biomaterials are intended to interface with biological systems to evaluate, treat, augment or replace any tissue, organ or function of the body. A biomaterial is different from a biological material such as bone that is produced by a biological system. Artificial hips, vascular-stents, artificial peacemakers, and catheters are all made from different biomaterials and comprise different medical devices. 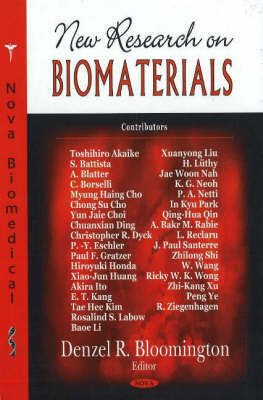 This book presents new approaches to biomaterial development including multi-field bone remodelling, novel strategies for conferring antibacterial properties to bone cement, polyacrylonitrile-based biomaterials for enzyme immobilisation and functionalised magnetic nanoparticles for tissue engineering.